A brief description of the setting for each song will indicate the development of the plot. Joseph Taylor, Jr. – Allegro Singing Ensemble As the curtain rises the lights come up slowly and are concentrated only on the bed where Marjorie (Mrs. Joseph Taylor) lies, looking very contented. Another light comes up on the opposite side of the stage, revealing the choral group, which describes the mother’s joy and the baby’s features. I Know It Can Happen Again – Muriel O’Malley So that Marjorie can get some rest, Joseph Jr.’s Grandma picks him up and places him in a bassinet, as the bed “rides” off the stage. Reflecting on her own life as a mother, Grandma Taylor sings tenderly to her young grandson. One Foot. Other Foot – Allegro Singing Ensemble Marjorie and her mother stretch out their hands toward the audience, where presumably young Joe is trying to take his first steps. The chorus sings him an exciting march of encouragement. A Fellow Needs A Girl – William Ching; Annamary Dickey It’s the night before Joe’s departure for college, and his parents are sitting on the porch in the moonlight. Concerned for his future and about the kind of girl he will marry, they sing lovingly of their own happy marriage. So Far – Gloria Wills Joe’s home-town sweetheart, Jennie Brinker, has been writing him letters indicating she is interested in another boy. Now, along comes Beulah, who is cute and also a bit brazen. To summon up the courage to kiss her, Joe takes a flask out of his pocket, drinks from it, as does Beulah, who breaks into song. You Are Never Away – John Battles; Allegro Singing Ensemble Realizing that Beulah is wrong for him, Joe is overjoyed when a letter from Jennie arrives saying that she has broken her engagement to a local boy. The scene changes to what appears to be the garden of Jennie’s home. She stands beside a bench, looking radiant, and Joe gazes at her in rapture. With the discreet assistance of the chorus, he sings what is perhaps the loveliest song in the score. Wedding: To Have And To Hold; Wish Them Well – Allegro Singing Ensemble Inside the church the guests have assembled for the wedding of Joseph Taylor, Jr., and Jennie Brinker. 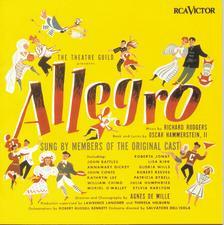 We hear Richard Rodgers’s moving choral setting of the marriage vows. Then, as the minister’s lips move silently, delivering the rest of the service, a chorus of good wishes is sung to the bride and groom, bringing the first act of Allegro to an exultant close. Money Isn’t Everything – Roberta Jonay; Kathryn Lee; Julie Humphries; Sylvia Karlton; Patricia Bybell Act II opens in the backyard of the newly married Taylors’s home. Jennie, taking care of some laundry, is joined by four of her girl friends. They bemoan the housework they must do and belittle the women who are better off. “All they do is try to look beautiful,” says one of the girls. Their misery is described to the tune of a typically lilting Rodgers waltz, set to an untypically sardonic Hammerstein lyric. The Gentleman Is A Dope – Lisa Kirk Emily, the nurse in Joe’s swank Chicago office, has just left a hospital executives’ cocktail party, thoroughly disgusted by the way her boss has allowed himself to be taken in by the pompous trustees, the dishonest doctors, the neurotic patients and the empty cocktail prattle. Standing on the street, she watches an imaginary cab or two whiz by her. Then, pulling her coat collar up, Emily sings to herself bitterly, and we gather that her interest in Joe is not entirely a professional one. Allegro – John Battles; Lisa Kirk; Robert Reeves; Allegro Singing Ensemble Joe is finally beginning to look objectively at the politics and hypocrisy rampant throughout the hospital. He joins Emily and Charlie, a school chum who is also on the medical staff, in a lively, scornful number, which effectively sums up the empty, frenetic existence they have all been living. Come Home – Annamary Dickey; Allegro Singing Ensemble Having decided to turn down the position of Physician-in-Chief at the hospital (to the utter disbelief of its executives), Joe sits at the desk in his office in a meditative mood. Lights come up gradually behind the scrim, revealing his parents and a group of his old friends. Their warm voices, the touching music and the tender lyrics they sing convince him that he must return home to be with the people he loves.